This week Cara and I decided to conquer some milestones for Team-UP Thursday. Her little boy has learned how to write his name. Look at his sweet handwriting. I am very impressed. He has a hard name to learn to spell too. My little boy has learned how to ride his bike with no training wheels. He might be afraid of heights and water, but he is not afraid of speed. He is crazy on this bike. A few minutes after the training wheels were removed, he was riding with no problem. As you can tell, he needs a bigger bike. Good thing Christmas is right around the corner. Join us for Team-Up Thursday hosted by Megan and Melody. 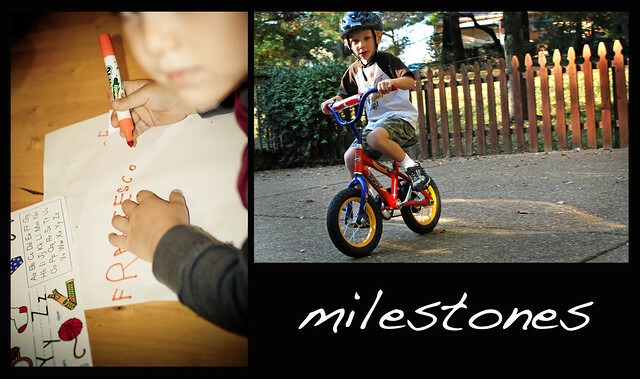 I love that we both have our boys featured as the milestone makers. It funny you say Miller is afraid of height but loves speed, Francesco is just like that! MILESTONES would have been a tough one!!! GREAT examples of your theme. That IS a HARD name to spell - but he did so well and your little guy is rippin' it up on his bike - perfect size IF he's afraid of heights!!!!!! GREAT JOB, team! Thanks so much for dropping by my blog so often - your the best. Wait a minute - MILLER can ride a bike without training wheels?! No way, he's too little for that! I am super impressed. Way to go to both of these big boys! Aw. Milestones are so bitter sweet. Such proud moments but also just more reminders that that are growing up! Go Miller! WOO HOO! GO Miller! That is awesome - way to rock the milestones this week, ladies! yea for fun childhood milestones. i guess our milestone here was the broken arm...not so fun;(. Love the new header, btw. I SUPER DUPER need to change mine (Christina has mentioned it to me 2 or 3 times now, lol), but I just cant find anything I wanna use. I feel like the whole thing needs to be revamped, but who has the time?! :0) Anyways, very seasonal. Love it. Way to go Miller -- what a big boy he is becoming! Both of these are very sweet pictures. :) Miller looks like he is a pro without those training wheels!